Whats new at Playful Papillons? 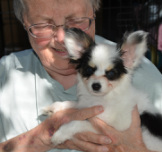 I'm going to try something new... Every month I’ll try to put together a newsletter with various topics regarding Playful Papillons and our extended families... feel free to email me with any updates if you have a papillon from my program or would like to be part of our newsletter. I want our website to be fresh and have current information. Newsletter will appear on this home page. 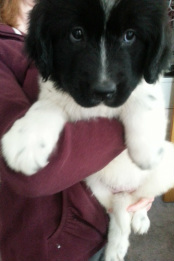 Playful Papillons welcomes this beautiful little female AKC Newfoundland to our home. 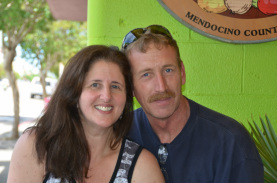 She arrives mid June and we will update photos. We are excited to see how the papillons get along with her. AT the moment we are trying to think of a cute name for her. So far Madi and Nanna seem to be in the running. Feel free to email me with more name ideas. 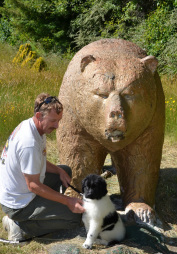 Thank you very much to Mary Pat in Washington for this beautiful pure bred Newfoundland. Little Lindy is being Co-owned with Marcie and will be possibly doing nose work or fly ball..lets see how it goes but one thing is for sure...they love each other so much !! 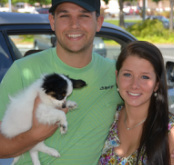 It was wonderful to place Panda with Bryce and Courtney as a pet. Both are professionals and Courtneys father is a veternarian. He flew out to visit and he is so excited to see Panda! 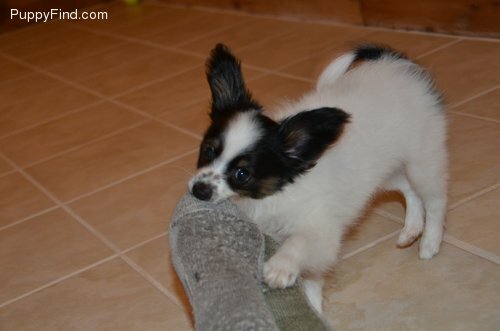 My daughter and her husband are visiting their future Papillon. Her parents are Chuck and Glory. She was born February 28, 2013. They are very excited for her to join their family later this summer. Linda brought Cooper over for a visit. He got to run around with Dasher and became reacquainted with the house and MaryAnn. Cooper has been with his new family for a year and he looks absolutely beautiful. His Father is the handsome Nemo and Mother sweet Skittles. Thank you for a lovely visit Cooper and Linda ! 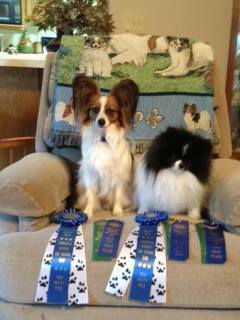 From Susan Pierce in Arkansas..
We had a great week-end in Springfield, MO at the SMDTC Agility Trial. Chance got his Open Standard title Friday with a perfect score and first place. Then Sunday he got his Open JWW title with another perfect score and first place. And Sunday Zoe got her 2nd leg in Open JWW with a perfect score and first place. Way to go Chance and Zoe!!!! !